Christopher Hill spent a lot of time in the world’s hotspots – Kosovo, Bosnia, North Korea, post-surge Iraq. If you have never heard of him, I’m not surprised. Diplomats are rarely household names. 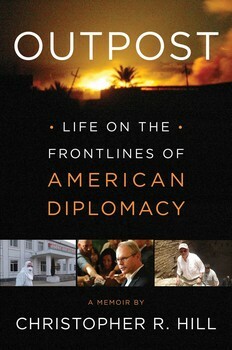 Outpost: Life on the Frontlines of American Diplomacy is Christopher Hill’s memoir. He had many consequential jobs: working on the negotiations that ended the Balkan wars, leading diplomat in the Bush administration’s talks with North Korea, ambassador to Iraq. And yet he remained outside the nexus of power that fascinates the media and public alike: the president, the vice president, secretary of state, secretary of defense, even national security advisor. This is a different sort of memoir, America’s foreign policy from a viewpoint I had never fully seen before. I found it very informative. I learned a great deal about the North Korean negotiations and America’s involvement in the Balkans, though I wish Ambassador Hill had dealt with Kosovo and Bosnia in even greater depth. He never explained why, exactly, America was invested in those conflicts to the point of bombing campaigns. If it was a matter of violence, or human rights violations – well, there’s a lot of that in the world, and the Serbs were hardly the leading villains. Saddam Hussein, to take one not-so-random example, certainly had them beat. And if it was a matter of American interests – I can’t think of any American interests, nor does the book provide any, except that our involvement was good for our “transatlantic relationships”. In fact, reading Hill’s account, one is left with the impression that our military-level involvement just sort of happened. America was trying to negotiate an end to the war, and the Europeans had peacekeepers in blue helmets and white tanks there, and it was all very difficult, and since America would have to intervene militarily to help extract the Europeans, it might as well intervene militarily to enforce peace, and so we bombed the Serbs. And maybe it really was no more deliberate than that. The Iraq section was informative, too, providing a closer and somewhat dreary look at Iraq. Hill portrays attitudes in Washington toward Iraq that ultimately contributed to the present debacle: disinterest, neglect, a hurry to get out with little attention paid to the consequences. I learned lighter things from this book, things from the world of diplomacy. I learned, for example, that ambassadors may judge you on how many lunch options you need for a visit to their country. I learned that calling Macedonia “Macedonia” can be a minor act of rebellion. I learned that diplomats will not only lie in the course of duty, they will openly admit it in their memoirs. Unfortunately, Ambassador Hill cheaply caricatures the “neocons” as warlike, aggressive, and imperialistic. The book’s only justifications for these insults are that neoconservatives opposed Hill’s negotiations with North Korea (oh, the aggression!) and urged the Iraq war. Hill also mentions “liberal war hawks”, though how he distinguishes them from the warlike neocons is entirely unexplained. Along with its accounts of vital negotiations and ambassadorships in nations such as Poland and Macedonia, Outpost paints some very human portraits and some poignant moments. Recommended to anyone who is interested in diplomacy, history, or the controversies and conflicts of the past twenty years.